5 Fun Halloween LEGO Ideas! If you’re looking for a fun and frugalicious way to spend a few hours having fun with the kiddos, why not make some Halloween decorations from LEGO!! Using the basic LEGO pieces that you may already have at home, you can create a wealth of Halloween characters, from ghosts to ghouls! Now – remember that there is no RIGHT or WRONG way to build a LEGO model – you just have to use your own imagination and you can work wonders. Even if you don’t happen to have the exact pieces that the makers use in these tutorials – just work with what you’ve got. The tutorial looks like it uses some pretty basic pieces which are a staple part of any LEGO kit so this one should be very easy to do. There are a lot more tutorials out there though, so feel free to do a bit of googling yourself. What I would suggest is that you make do with the pieces you have, and work on the above theme. The bat uses a lot of basic black pieces. I don’t have a video for this one, but you can get the idea here. It just uses some basic green, black and white bricks. You can make it as little or as large, as plain or as detailed as you like! And if you make any of the above, we’d really love it if you share some piccies with us! 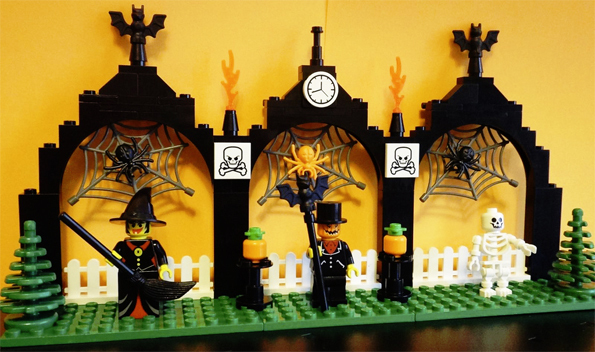 Do you have any more ideas for Halloween LEGO projects?